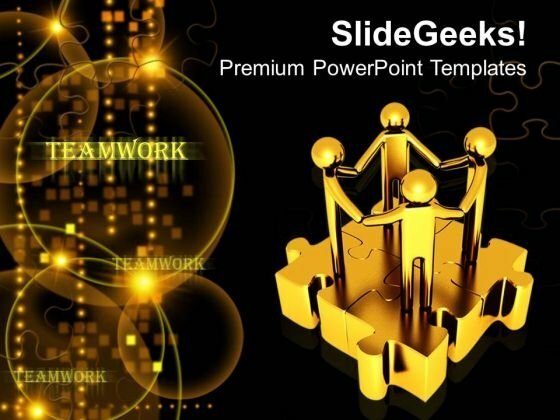 3d Men With Unity PowerPoint Templates And PowerPoint Themes 1012-Create visually stunning and define your PPT Presentations in a unique and inspiring manner using our above template which contains a graphic of golden 3d men uniting on jigsaw puzzle pieces. This image has been professionally designed to emphasize the concept of teamwork, cooperation and solution. This image has been conceived to enable you to emphatically communicate your ideas in your Business PPT presentations. Present your views using our innovative slides and be assured of leaving a lasting impression.-3d Men With Unity PowerPoint Templates And PowerPoint Themes 1012-This PowerPoint template can be used for presentations relating to-"Men with unity, teamwork, puzzles or jigsaws, people, success, business" Keep away from fallacious arguments. Our 3d Men With Unity PowerPoint Templates And PowerPoint Themes 1012 will extract the facts. Our 3d Men With Unity PowerPoint Templates And PowerPoint Themes 1012 have more than what meets the eye. They contain additional dimensions.